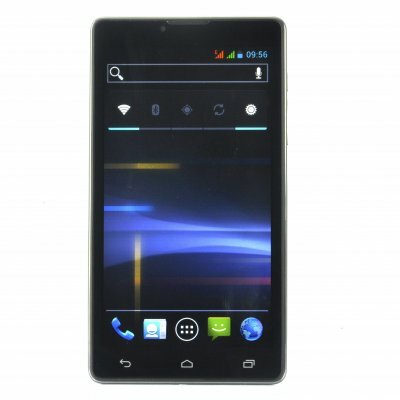 Successfully Added 3G Android 4.0 Phone - 1GHz Dual Core CPU, 6 Inch Screen, GSM+WCDMA to your Shopping Cart. Android 4.0 phone with dual core 1GHz CPU and a large 6 Inch screen utilizes both the communication capabilities of a smart phone with the screen of a small tablet PC. This dual core 1GHz CPU Android 4.0 phone combines the entertainment features and screen of a mini tablet PC with the communication capabilities of an Android cell phone. This delight of a cell phone won’t weigh you down even though it has a large screen. When placed in your hands this phone feels natural and intuitive to use and play with. Its large 6 Inch display offers you full entertainment at your fingertips in full clarity, as well as giving you the power to do all the things that you would expect from a fast 1GHz CPU Android device, such as gaming, browsing the internet or downloading any of the thousand apps from Google Play Store. Additionally, this Android 4.0 phone tablet combination comes with an in-built GPS system that gets you to your destination without fail, on foot or in your car! And with an incredible 8MP rear facing camera, you will be able to record videos and take pictures and view them on a clear large screen. Buy this Android 4.0 dual core 1GHz CPU phone hybrid with GPS now and begin making some extra money or get one for your own at an unbeatable price! Order now and we'll ship it out from our warehouse tomorrow. From your reliable source for latest Android smartphones and devices, Chinavasion.